This is just stunningly beautiful! I absolutely love it! The colors are alive! Thank you! I received the painting today and it's gorgeous. My husband and I love it and it's even better in person. Just perfect for the space. Love the painting! Looks great in our art niche. I received this item promptly last week and I love it. It is so beautiful and looks fantastic in the space. The painting is stunning. I need to invite more people over to see it. It was exactly what I was hoping for. The preview gave me a good idea of what to expect, but it didn't do the painting justice. Shipping was perfect. It got here fast and the painting was well packaged. I just received the painting. It is stunning and the colors are true to the image! Thank you Osnat! We are thrilled with our new piece. It is perfect for our beach house. The workmanship is exceptional. We've had many many compliments about it. It was shipped with care and clearly made with passion. This is such a beautiful painting. I absolutely LOVE it! Can't wait to hang it up in my new apartment - it will be the focus of the room! Thank you so much! The painting arrived quickly and very well packaged. This painting struck me the moment I looked at it, I kept going back to it, often times just to look at it to get caught up in its mood. I'm so excited to have it in my house now, hanging exactly where my attention will be most of the time, inspiring me as it does. Thank you, it's an amazing painting. 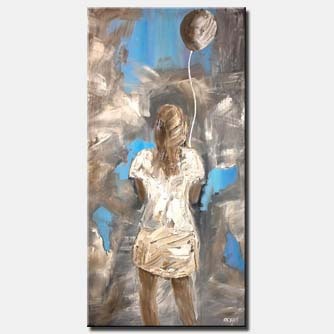 Love this painting - vivacious, yet contemplative. Very talented artist - quick shipping and expert packing! Painting looks beautiful in it's new home. Service was timely and accurate. Thanks! 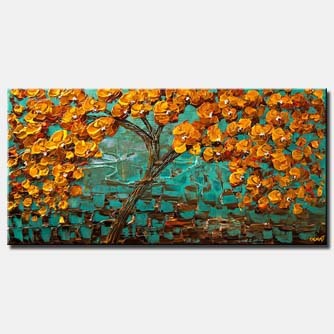 Love the colors and texture of this fabulous painting. The painting is phenomenal! You do superb work and it is much better than the pictures on the web! I am decorating an entire house and will be sure to look at your work when I begin on my next room. I will be sure to purchase from you again! Delivered faster than I expected, packed impeccably. My piece was even richer and more vibrant than I hoped. Thank you. Painting arrived on time in perfect condition. Images show a wonderful representation of the work. Thanks! Painting is beautiful! It got here quickly and in perfect condition. Adorns my living room. I can't get enough of it. colors are vibrant and "eye-popping". One very beautiful piece of art!! Lovely ... and the seller is wonderful to deal with. Thanks so much! This painting is gorgeous and exactly what I pictured - it is honestly amazing and I would not hesitate to buy from Osnat again - gorgeous work. Osnat is a true professional. She was excellent to work with and the painting arrived promptly, was packaged very well. Her artistry is exceptional and we are enjoying this painting hanging in our house. 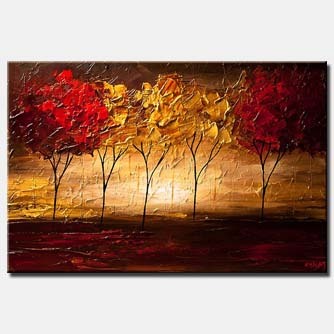 This is a fabulous painting....rich in color, and texture! I could not be happier!!! Thank you for your art and your professional care. I will be back to buy more!!! Your art takes the room! Product was shipped quickly. Artwork looks great both up close and far away. Love the texture. Good evening Osnat! We received our paintings today and they are just perfect!!! Thank you so much. It has been such a pleasure working with you and I look forward to purchasing more in the future. Have a wonderful night! This painting is absolutely stunning. I Love It. Osnat is amazing. She emails regular status updates while creating the painting. Shipping was on time and delivered in perfect condition. I intend to order another from her collection. Hi! We were finally able to hang the piece we ordered a few weeks back. We are absolutely thrilled with it! The colours are perfect & it adds so much personality to our home. Your work is incredible :) Thank-you! The painting arrived about an hour ago in perfect condition, I have already unboxed and hung it, it is perfect for our space and quite beautiful. Your an excellent artist and I really appreciate not only your work but how efficient a business person you are and easy to work with. Many thanks. Michael. I am so thrilled that I won this auction. My husband wanted this so bad. It will grace the wall proudly in our new home. Thank you so much for helping to make the world a little more colorful, pleasant place to be with your gorgeous artwork! Hello my friendly Northern neighbor. I got the beautiful painting in the mail today. It is fabulous! You did a great job. I want to thank you for everything and your personal attention to my "unique" shipping needs. I hope to get more paintings in the future. I wish you the best of luck and hope to purchase again. I just got it now. Thank you so much for your communication. Very nice to do business with you. I left a feedback for you..( I wish I could write more than 80 !!!). I would love to see more of your paintings...very very wonderful! , so please keep working....You are the Best!!! Thank you very much, again. Every morning when I am not traveling, I can't wait to hop on line and see what you have done next. I love your new paintings. I am especially fond of 'Show me the Way' and 'By the Sea'. They are both so organic and you seem to have such a wonderful knack for knowing how to name your paintings to reflect the emotion they engender. Both are fabulous! I am still hoping that the inspiration will lead to another 'Restless Earth' that captures my heart like the one you sold at the end of July. So sick that I missed that one still. I have been watching the one you did to try to recreate it and am hoping that the price climbs for you prior to the close of the auction. You should get a much better price than it is at. I know that things tend to rise in the last two hours so will see later how it is going. I wish I could swap that one with the person who bought the first but can only imagine that they are as enamored with it as I am. Isn't it funny how the paint, canvas and artist conspire to create something different every time they convene? I love the fact that each piece you create is so unique. That is proof enough that you have a passionate gift, not just skilled training. I also think 'Eye of the Storm' is extraordinary. If I weren't anticipating selling my house with all its huge walls I would just go crazy buying your work. So I am trying to discipline myself to ensure that I will always have the space to display your work. I am certain that I will always want it where I can see it. Have a wonderful, inspired day. Thank you so much for painting these for me. My wife and I will enjoy them very much. I'm looking forward to this green image on my pumpkin walls. I'm now up to four of your paintings...am delighted, and totally crazy. Thank you I look forward to receiving my second painting from you. I'm thrilled to have been able to purchase it. Your work is exciting. Thank you, the paintings are beautiful!!! Thanks again. I love my painting!! Your work is absolutely beautiful. Wow! 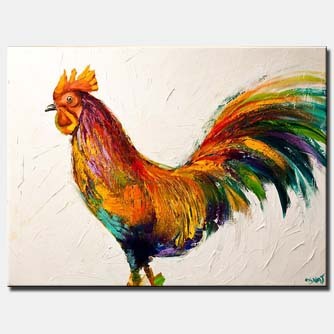 I am another artist on eBay and I just saw your painting and I felt compelled to say "Congratulations!" 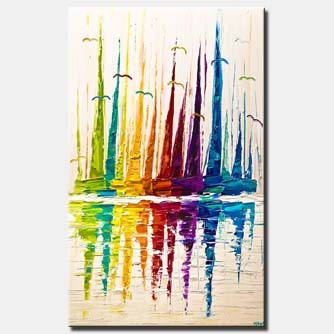 This painting is GORGOUS!!!!!!!!!!!!! I have never written another artist about this before, but there is something about that painting that is amazing. I just wanted to tell you. All the best. Hi again! 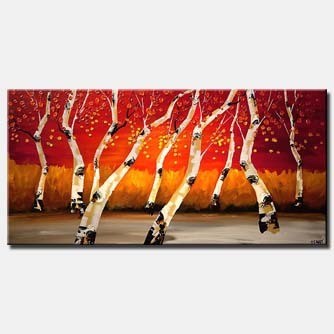 We so love this painting! Wish we had more wonderful creative minds like you! Good Night and best of luck! Thank you for your prompt response. I was so impressed with the painting that I joined paypal just to make this purchase. I am eagerly anticipating receiving the painting. Thanks so much Osnat, We received Equality today and it looks great! Thank You so much for creating it for us. My brother recently came over and really loved the piece you painted for us. I was interested in another of your pieces 'Equality'. as a Birthday gift for my brother. If you could please let me know the price for this piece I would appreciate it. The painting arrived a day early and I love it! The picture on eBay really didn't do it justice. I love looking at it; it is so peaceful. I am so glad that I found your artwork. I forgot to mention, when I found your art, I wasn't even thinking about buying a painting. I don't really know a lot about recent art and am not familiar with current artists so at first, I thought that your art was actually a type of art (like impressionist, cubist, etc.) because it was so different from anything that I've seen. After I saw your paintings, I fell in love with them. I am so glad that I found them and that I was able to actually purchase one of them. Hello, I've been traveling so much I'm behind in everything, but I wanted to let you know the painting is absolutely magnificent. Thank you so much. I'll continue to watch your creations. All the best. Thank you very much for sharing your gift and passion with us. 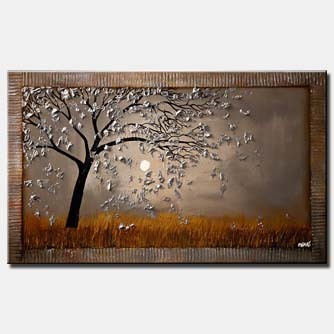 Every piece of art listed is absolutely divine, its beauty is apparent for all to see and enjoy. I cannot afford your work, but I want you to know that I get such strong feelings and emotions when I look at your paintings. They touch my soul. I am so happy that someone of your talent is making their work available to all people. When I see something that touches me I recognize it instantly. I believe your inspiration is Divinely guided. With warm regards, Rebecca. I loved that piece. I love your art! The colors are bright, strong, detailed, blatant and explosive. The designs are unique and elegant. I fell in love when I saw your art! Every time I think you have expanded my consciousness with your art you surprise me all over again. I have bid on this piece and I'm going to keep my eye on it so not to lose again. Thank you for sharing yourself through your work and for bringing such happiness to me. Just wanted to let you know I received the painting today. I haven't been able to fully unwrap it yet, but it looks like it will be great. Thanks again! I really enjoy all of your works. Your piece 'Chariots of Fire' is a piece both my husband and I love however we need it bigger. The colors and geometric shape really look as though they we're made for our home and I have been looking (on and off) for 2 years for a magnificent piece to put in our living room. So I'm really excited to see on your informational page you do commission!! I received the paintings in good condition and I just got around to hanging them last night. They look great. 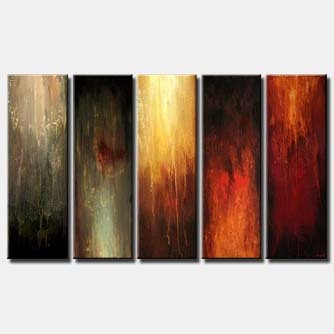 That opening just never looked right but with these canvases hung toward the front, there are no shadows just a great warm glow. Thanks again. M.W and L.S finally were out of the office this afternoon and we unpacked the paintings. And the staff, at least the ones that were here at the time, love them. We're all very excited and can't wait to present them next Friday, one week from today I greatly appreciate all your help with getting these done so quickly and I hope we can work together again some time in the future. I received my painting and my husband loves it as much as I do. It's really lovely and I appreciate you getting the special canvas the size is perfect. ...BUT BEST OF ALL! We received 'IN BETWEEN' today! WOW WOW WOW!!! This is just tremendous! This is just the coolest painting. The depth, the colors, the bright yellow/orange centers, and the way they "fit" together. They are propped up on the back of the sofa and look so great against the wall. I will not officially hang them until we get the mirror that goes on the other wall so we can coordinate the height. This matches the room so much better, too, than the other one did as it had so much more blue, and we like your color selection better in this one. It blends in better with the opposite chair, walls, and carpet. Such a rich looking piece! THANK YOU THANK YOU THANK YOU for making this up special for us. We will thoroughly enjoy it and we know we will get many compliments and oohs and aahs! I picked up the painting on Saturday, and hung it yesterday. It is fantastic! Thanks so much for your follow-up. I can't wait to find the right place for the next piece! I will be in touch. Keep up the great artwork! I just posted your feedback. Not enough room to say all I wanted to say about your work. Still may get another one. Warm wishes. I am sure you get many comments daily about your work, but I must say it is truly something unique you have to be able to express emotions, thoughts and feelings in your artwork! never expecting to be inspired and touched! Thank you for opening my eyes, and my senses by your expressions! Hi Osnat !! Its me Nicolas, remember you make a painting for my wife birthday, she just have it, and we will like to tell you a BIG THANK YOU!! It was very appreciate that you did to us a special request!!! We both like a lot your painting!!!! :o) Thanks again!! Your painting is lovely. Already got a comment from my vice president of construction. He was eyeing for himself so I told him that I pay him enough to buy one of his own. We got the painting today! It is absolutely breathtaking, my favorite yet! We left feedback on eBay. The painting is a beautiful piece of art. My home is done in a very late 60's 70's style and color scheme of greens, golds and oranges. The painting looks fabulous in my living room. Thank you and enjoy your day! She loved it!! It looks perfect in the place I had pictured in my mind when I purchased it!! Thanks again. Hope to purchase more paintings from you. Dear Osnat. I just received your painting, and I'm really pleased with it. All the best to you. Picked up painting today at post office. Arrived in perfect condition and just as beautiful as I had hoped. Thanks for follow up on shipping. I left feedback for you. Thanks again -a pleasure doing business with you! Rh. I love the first piece and have the perfect spot for this one. Have a Happy Holiday. Hi Osnat! I just received it today, the painting is Superb!!!! My girlfriend fall in love with this painting to ! She wants to write to you. She will tell you how happy she is and how beautiful is your painting!! Thanks again for the super and friendly service you give to me!! I was out of town and just got back, I want to thank you so much for the painting. It's great. 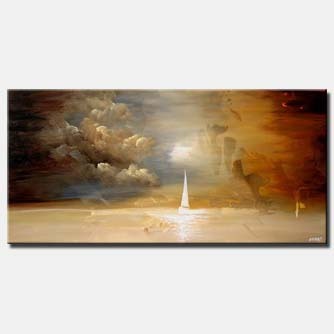 Received the painting (Golden Mist), and as with last time, am thrilled with the piece. I left you positive feedback on eBay. Thanks again and keep up the beautiful work! Wow. Now that was fast shipping!!!!!! Thank you Osnat for sending that so quickly. I thought my son was kidding yesterday when he called and told me it was here. I'll be watching your site. I just got my paintings ['Reflected Beauty' and 'Seasonal Hills'] and I love them, I will email you a picture of them in their new home. I left feedback for you but there was not enough room to put everything I had to say about you and your work. As I said before I have my eye on Le Grande and Fragrance and I check your new auctions every day. I know one day when I visit the Metro Museum of Art and pass your paintings I will be able to say "Ahhh yes, I have several of Osnat pieces in my personal gallery. Thanks again, the whole experience has been a pleasure. We received the paintings and thank you very much for sharing the beauty of your expressions. The paintings grace our living room and getting a lot of compliments. Once again I just wanted to thank you! These are beautiful. I've been staring at the set for hours. After a few purchases that were poor quality or misrepresented, I am enthralled to finally put a winner on my walls. Received the painting ['Restless Earth'] Saturday, it is absolutely beautiful. Thank you. it was packed well and looks excellent in my home. I will leave feedback on e-bay for you. Thanks! I got the painting and it is great. I simply love it. I received the painting today. It is simply lovely! My husband went crazy over it. We want to move TODAY so we can hang it in our new home. Thank you so much!!!! My mother and I received your painting in the mail yesterday. REMARKABLE, OUTSTANDING, AMAZING, are just a couple words that came to our minds as we were blown away by the painting we had received. Thank you so much for working with me get this gift for my mother. I am such a huge fan of your art! You are truly talented! Thank you again, as soon as the painting is mounted, I will send you a photo for your gallery. It was while seeking to elevate the soul to greater things online that I was blessed to find your online home. The singing of your heart is evident throughout your site as your pages are inspiring and enriching. You are a gifted individual whose authentic and original presence is a gift to all blessed to peruse your pages. Thank you for sharing who you are for to do so nurtures the spirit. I celebrate your accomplishments and honour the path you are on. Know that your life and work are significant and meaningful. You are appreciated and respected. I wish you a life of positive thoughts as you sail the seas of love and harmony. May you explore the deeper meanings of life as you attract joy and fulfillment and may you manifest higher consciousness as you live with light and connect with your souls wisdom. 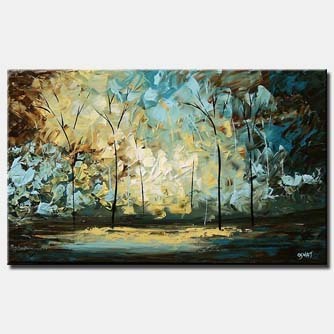 As a beginning self-taught painter, I have derived great insight and inspiration from your paintings. As a professional jazz musician, i have come to understand the profound balance that must be achieved between organic exploration dashed with insight, and strong technique built on practice, repetition and the history of your art. Learning from those who have mastered their art is essential in any case. I have found you to be one of the most inspirational painters i have looked at. Thank you so much for the beautiful gifts you offer, for the world to enjoy. Your paintings have such depth and clarity, it is an overwhelming emotion every time I indulge in admiration. Unfortunately unable to ever afford any of your works, I want to send you a special thank you, for giving the opportunity to people like me to enjoy them on your site, and to enable us to spread the beauty with others through your e-cards. 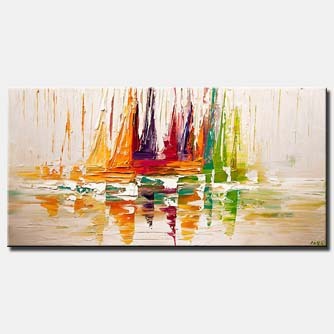 I think most abstract art is easy to recreate, and does nothing more than add a little color to the wall. However, your abstract pieces are amazing! They seem to have an other worldy characteristic. 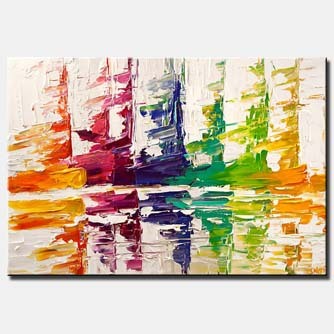 THIS is what abstract art should actually be! I accidentally came upon your web site. I want to let you know about the impact you had on me. Your use of light and transparency is fenomenal. 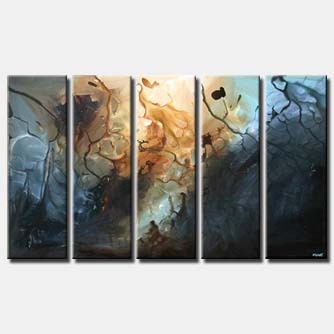 I do not know much about abstract art, but I can tell you this...your work is stunning! Please allow me to express how much I like your art. Your expression, talent and balance is beyond anything I have ever seen. 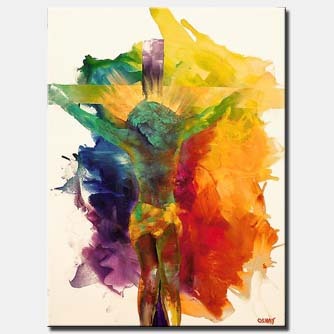 I found your site while looking for "techo art ecards"....For the last hour I have been inspired, uplifted, touched and moved by the fascination of your work. Hi, I would love to know where you get your inspiration from? When I look at your paintings I see passion and fire. I see love and I want you to know that your paintings have inspired my own. 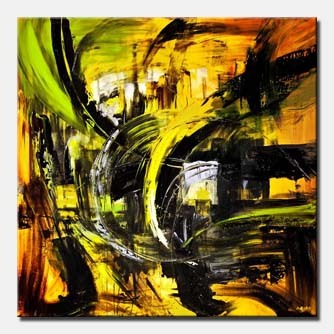 I love your style and I love your abstracts. You Ms. Osnat are gifted. Hi,I want to thank you once again for letting me purchase your beautiful and amazing work.I will be sure to spread the word on just how unbelievably well crafted your art is.You are truly blessed,God bless you and your family. I just wanted to let you know how much I love my "Metropolis". It arrived today and we already have it in place. We are so pleased with how easy you were to deal with and the quality of your work. I have received "Interaction" & absolutely adore it. The painting is all & more that I had hoped it would be. You are very talented & I am honored to own one of your pieces & especially so, because it is included in your brochure. I intend to spread the word of your wonderful artwork & talent. Thank you. My painting arrived about an hour ago and it is already unpacked and leaning up against the boardroom wall for Everyone to see...It is absolutely BRILLIANT/LOVELY! The website photos are beautiful but they simply don't do justice for the real thing. You did an amazing job and thank you for so much texture, you are truly an amazing artist. I feel honored to own one of your pieces. I am excited and sooooooo happy with it, I can't stop smiling. It will look even more beautiful once I get it home and hung on the wall. May the world continue to be blessed with the beauty of your work. I happened across your site (from the About.com site), and I am so amazed by the incredibly gorgeous and moving art you have created. It is just overwhelmingly beautiful, I could not even begin to pick a favorite, they are all so lovely and filled with so much of a sense of emotion and movement...or gentle stillness in others. You have a new fan, you have just become my favorite artist! I have to tell my friends about your artwork and your site, it is a wonderful buffet for the eyes! Hello, I have gone through your entire collection and all I can say is WOW. 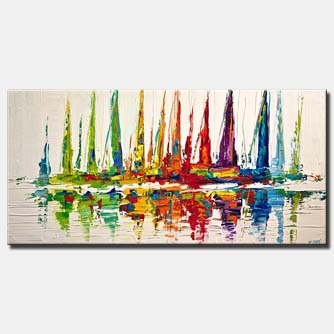 You are such a prolific artist and I love all the colors and the looseness of your style. What an inspiration. Thanks Garry. I am from South Africa, from the North Coast of Kwa-Zulu Natal and stay in a town called Richards Bay. I have taken art up recently and enjoy it so much. I searched the web for abstract art and came across your website. I have browsed through your paintings and I have no words, because there isn't a word in my vocabulary that can explain your fantastic talent. You are absolutely gifted! I bow down to God and thank him for creating people like you with such a skill and outstanding talent. I can feel your energy in your paintings by just looking at them. May your future be blessed as an artist but also for just being you! Have a great art life! 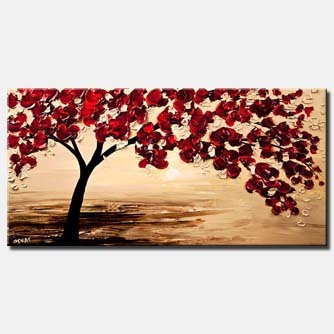 Hi Osnat just wanting to let you know that we are very pleased with the purchase of your painting. It is absolutely perfect for our great room and will always be a pleasure to look at. We will more than likely want to purchase another soon. I received the painting. Very professional packaging and all was well. I was going to hang in my entrance way, but it has taken centre stage above the sofa in the living room. My first purchased original piece of art. So proud! D.
Just received the painting today. I just want to let you know that the painting was unbelievable. The color and the technique was outstanding. My two kids, my wife and I really love it. it is beyond my imagination. The painting arrived safe and sound on Wednesday - it is beautiful. The size is perfect, colors breathtaking, just what I envisioned. Thank you so much! Your husband delivered the painting to us tonight and it was simply stunning. Thank you very much for making the beautiful piece of art and bring our living room to life. 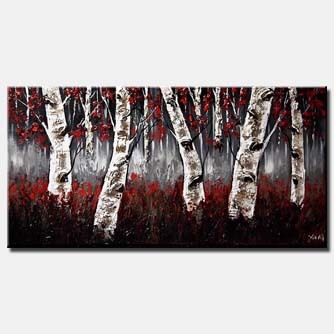 We will definitely buy more paintings from you and recommend to our friends and family. I received the paintings about a week ago. I fully expected that the actual paintings would be more vivid and alive than the images on your website and I was not disappointed. In fact, the color and contrast is more dramatic than I would have ever expected. There is also a depth to the paintings that can not be seen over the internet. Congratulations on all of your success and I wish you all the best in the future. N.
I wanted to let you know that our painting arrived yesterday and we could not be happier with it. We are in fact having some additional lighting installed to better display it. It is really beautiful. This is our first purchase of an original piece of art and I wish now we had started sooner. My hope is that we can purchase more of your work in the future and thereby be able to rotate pieces on our limited wall space. I would ask, if you have one available, for a bio on you and your work that we could secure to the painting. 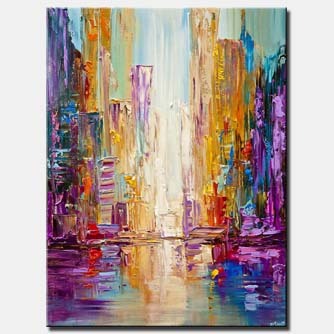 I would like to thank you for the beautiful painting of NYC skyscrapers. Its vibrant colors add a lot of dimension and atmosphere in our NYC apartment. We are very impressed with the fine quality and texture. We will be in touch if we decide to add to the collection. Thank you for your beautiful free e-cards....perfect for my friend who is ill.
Hi there, my name is Noelle. 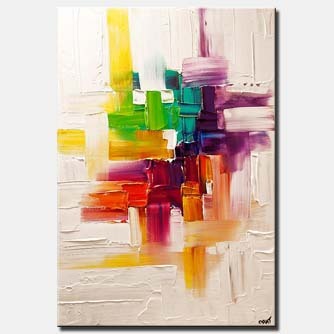 Ive had an interest in art all my life, abstract paintings being my favorite medium. I was looking for some inspiration, as I am a student artist, and happened upon your website. I just wanted to let you know, that the paintings I saw blew my mind away, and are quite mesmerizing. You are very talented, and very creative with your work. I do hope you continue with your creations for years to come, and I do believe you have just become my idol as an artist. Thank you for sharing your work with the world, and I hope to see more in the future. What can I say ??! 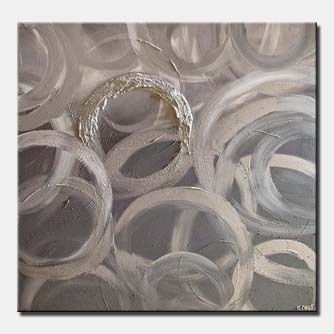 !...Have just been discovering your work on ebay and I am amazed and enthralled. Will have to start saving to buy one of your pieces. You are a gifted individual !! David. make people happy and excited. I wish you ALL the best and success for ever. I received your painting yesterday. It is absolutely amazing! I really wanted something that catches the eye when you first step into the room. This one really does it! You are a very pleasant person to work with. The online transaction went smoothly. The painting was very well wrapped and arrived to me super fast. I collected the other 2 paintings today. They are sublime. Really, I cannot think of a more appropriate adjective to describe your work. Thanks so much. Earth is blessed by your talents. You can bet that I will come back for more. This is fantastic. It is even better than I could have imagined. You are very kind to have painted this for me. You are a truly kind person and an extremely gifted artist. We received your painting, Tranquility By The Sea a few weeks ago and only just got the chance to hang it this past weekend. Thank you so much for your efforts on it. We are very pleased with it. We see it ALL the time as it is showcased in our family room / kitchen area of the house which is where we spend most of our awake hours. So, we have already been enjoying its beauty very much. It was a pleasure doing business with you again. I will highly recommend you to anyone that inquires. we have an open floor plan where the huge kitchen is connected to the living room where the painting is hung , no walls in between. We just had our kitchen redone from Corian counter tops to granite. Close company come over, walked right through the kitchen, directly to the painting admiring it and didnt even notice the huge renovation we just did!!! If that isnt a great compliment to you fand your work, then I dont know what is. Pleasure doing business with you, stay well, Ed. We have 3 of your works in our home that we purchased over 4 years ago. They are just as nice as the day they arrived and based on the reaction of your following we are not alone in our appreciation of your works. Keep up the good job!!! Your work turned out even better than we could possibly imagine. Weve gotten dozens of compliments from friends and family, and the bedroom finally feels complete. 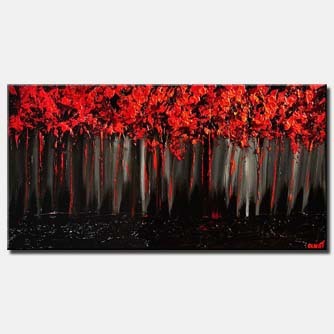 Your art is the first thing we see upon entering the room, and its hard to look away at anything else! Thank you SO much for sharing your gift with us. Your work has inspired me to explore my art further. I paint in the Classical Realism style and absolutely love it, but looking at the depth, form, intensity of colour aesthetics of your work excites me into wanting to create abstract works of art. I am a high school student who was assigned to do a critical analysis on a work of art of any kind. To be honest, I am not very good in the arts. I cannot draw for the sake of my life or do anything art related. I also did not enjoy really taking a moment of my time to really appreciate art or even take a second to look at paintings. Though, when I was assigned to this "critical analysis" for homework I took a second and breathed and thought that this would be the most boring thing to do. Pretty ignorant of me! But, the reason for this message to let you know that you have made a difference in my life. word of what a great artist you are. Thank you for taking you time to read this message. I cannot , cannot, CANNOT THANK YOU ENOUGH FOR THE BEAUTY OF YOUR TALENT AND YOUR WILLINGNESS TO WORK WITH ME. . I have not hung the picture yet, I am run so ragged al the time, but I know where I am putting it and I do see it every day and it brings me such joy. Yu are a blessing to the world and I feel so fortunate to have connected to you. I hope we can stay in touch. The paintings look absolutely stunning. It was well worth the wait. Will work on putting it up this weekend. Thanks again for a fantastic piece of art. My wife and I really appreciate it. I have been glued to your art work for the last two weeks almost every day, At times my eyes had to water a bit. I spend most of my Internet access going through your work and it is so never ending, it is out of this would. This what you having is pure natural healing, and you executed it perfectly letting the would see gods creations through you and that is without words to explain - breath taking. You have raised that fire of poetic collaborations of colour which almost burntout in this soul, my soul. Set the fire to the rain leave no Canvas naked. Just wanted you to know I am very happy with the paintings. 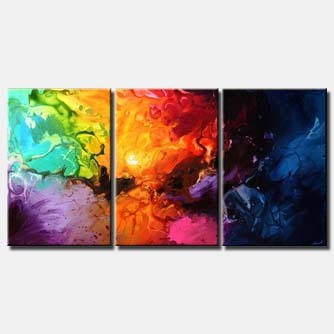 The colors are vibrant, exactly as they were depicted, and it looks great on the wall. Thanks! Sarah S.
My painting of "The Unknown Formula" arrived today after seemingly endless anticipation. Im in awe of its brilliance, both artistically and mathematically. 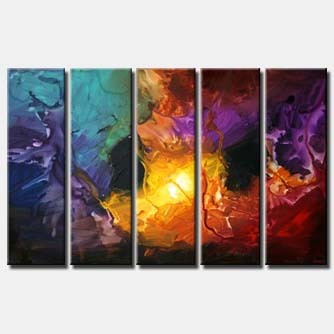 The colors are vibrant and balance the "formula" seamlessly. I love the liberty you took with the "pi" symbol. It is sure to be a focal point of conversation with guests and family. Thank you for your wonderful work ! 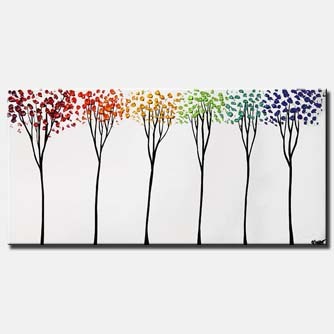 I just bought the "Thrive" painting last week and I love it! Thank you! I am now looking at adding one of your other pieces to my dining room. I wanted to write and let you know that I received the painting today, Purple Rain. It made it safely here and before the encroaching hurricane. I opened it and its absolutely beautiful! Thank you so very much! This is a stunning piece to see in person and we couldnt be more pleased. Was packaged well and arrived promptly. Thanks, Osnat! Painting arrived promptly and was packaged quite well. The texture and detail is beautiful in person and we are enjoying it very much. Beautiful and exquisite piece of art. Arrived in perfect condition and careful packaged in bubble wrap.. It is the exactly what I was looking for to hang in my living room next to my piano! W.
I am lost for words admiring the beauty gifted talents created. You are out of this world and it transported me into something so surreal. You bet that I will be getting more pieces to reflect upon the pleasant moods of life. 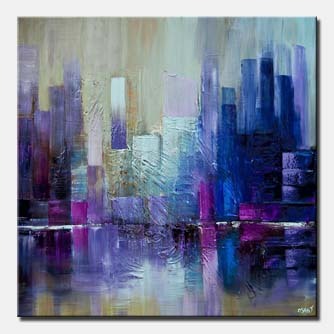 I came upon your "Future City" painting when I goggled abstract paintings. I just wanted to say that it is fabulous and your use of purples, blues, and greens rivals that of Monet. Wanted to let you know who much I love "Daisy", she is even more beautiful in person. I had to tell you how amazing your paintings are, I mean really! I saw one favorited by someone in my circle and it literally had a sort of emotional affect on me. The next logical step was to visit your shop and man am I impressed! Ive already decided that when Im in my own house, I will have you of your paintings! Save a good one for me! God has given you sheer talent, for being self-taught. I hope you always enjoy what you do and that you have great sales with smooth transactions all year! Received the painting today. Beautiful work and blends beautifully in our main living area. Also happy to support local talent and original work. Keep it up, I'll be back next year! Thank you very much for the lovely painting!!!! All of us and my friends like it very much!!! Just to let you know that Nebula arrived here in the Highlands of Scotland safely. Perfectly packaged thank you. We had already chosen a place & its perfect there! 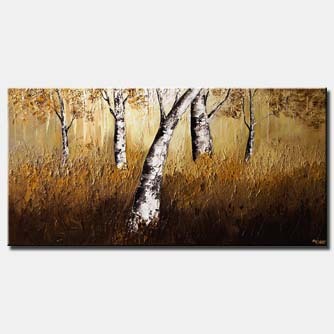 We couldnt be more delighted with the art, you certainly have extraordinary skill to paint it. Mary my wife says it reminds her of the Hubble space telescope pictures. Im now organizing hidden lighting to further enhance those beautiful colors. "Nebula" is in a happy home. I wanted to say thank you for allowing me to have an opportunity to have you as my subject for my Painting class essay. I wanted to let you know that I received an A+. I was very happy and excited. It was the highest mark I had among all my essays I've ever written. Thank you again for being such a great inspiration, your art is beautiful and you are very gracious. I hope this finds you well. I was looking about the web for inspiration and I found your site fantastic, your work is very modern and fresh, a great change from the traditional dark tones of western art. So I will say thank you for your inspiration, you have brightened my day. I received the painting yesterday. It is beautiful and lights up my room! Thank you so much. You made the process very clear and easy; thank you for the constant communication. I just received your painting and I am very happy with it. It arrived when you said it would and was very well packed. I was reluctant to order something like a painting online. 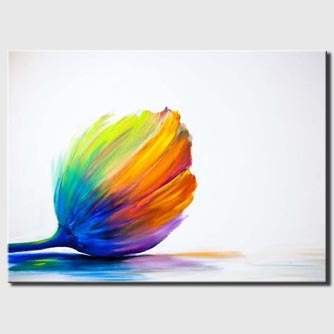 I have looked everywhere for something for my living room wall and stumbled upon your website. I am glad that I decided to just go for it because the colors are exactly what I hoped they would be and they pull everything together in my room. I am also very happy that you didn't paint the edges of the frame black. I like that they are an extension of the painting. I am sure I will enjoy your painting for years to come. Would like to thank u so so much for the paintings! They are beautiful and ur touch added a lot to it...we have been receiving so many compliments on them. Thanks again and for sure we will recommend u and repeat this experience again whenever we need more paintings. I received my painting of September and it is just beautiful! I was very impressed with shipping, the card in wrapping the painting and paperwork sent with it. So happy to have found your site! I will be ordering some prints for my living room but need to buy furniture and finish painting walls and trim. Thank you so much! We hung the painting today. It looks great, thank you again. Just what we wanted and needed for the space! Also, thank you for sending it when you did. we will hang it for our guests (and us) to enjoy! I'll send some pics once we frame it! The painting has arrived in mint condition and I LOVE it! The colors are perfect for my living room and it's warm and enchanting and beautiful! Thank you so much! It's a wonderful piece and I am lucky to have it! I have rec’d and mounted the giclee print you sent me. As usual the shipping time and packaging were great. Thank you for the embellishments you made on the print. They really made a difference to the final product and were generous. To be honest I really did want to buy another of your works as my condo is full of them but after two months of searching on the web, they was really nothing I wanted more. Thanks again! We received our painting today. It is beautiful! Just wanted to let you know that I received the painting and I love it. It's by far the coolest art / furnishing I've ever owned. Thanks! I have just received your picture. It is so beautiful! It’s like magic! I love it! Thanks. It arrived today and now centerpiece to our living room. I really like how you've embellished it. We wanted to let you know we received the painting yesterday and we LOVE it. Great detail in color and I love the side colors to match. It looks perfect where we put it so thank you for all your help. I just received the print and it looks fantastic! Makes a world of difference to my office . I just wanted to let you know the painting arrived today and was more beautiful than I even anticipated! Thank you so much! It was exactly what we wanted and hoped for. 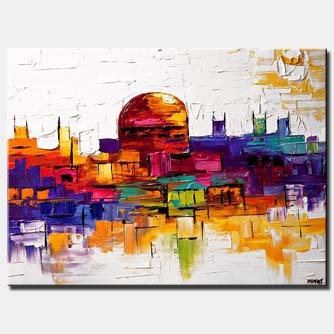 We got the painting Osnat.. its really amazing.. bright colors .. thanks for the great job. An absolutely brilliant painting. 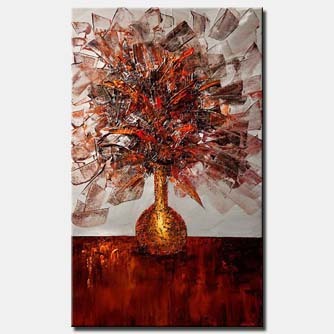 It brings with it much joy, and pleasure as it hangs beautifully on the wall. I have very high ceilings in this unit, I hope the picture does it justice. Again, thank you for such a lovely painting. A perfect addition to my home. 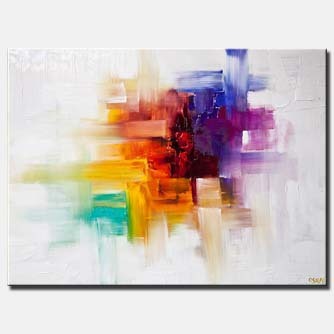 I really love your work - especially all the abstract pieces - amazing expressions of color. 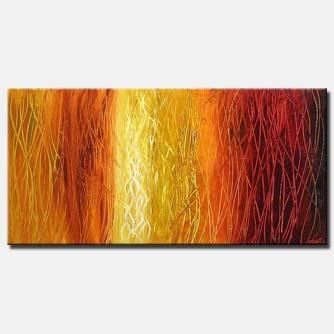 I found your work when I was searching for a vibrant and bold contemporary background to highlight our new gift box. My wife and I are small business owners who have been involved in home design and sales consulting the past years. We are now launching a premium gift box company and have been busy trying to find the right colors and 'upscale' look for our box and website branding. When we came across your Childhood Memory piece we knew that we had found the perfect picture. 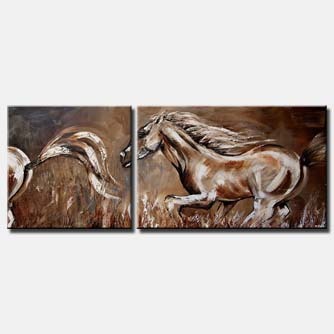 My husband and I have purchased three of your paintings in the past and have loved them. 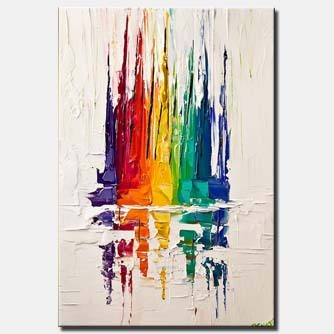 We were wondering if you would do any custom abstract art that reflected the beauty of the area where are wedding took place? 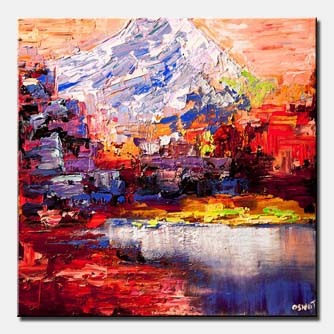 We were thinking an abstract painting (we love the texture you add to your paintings) reflecting Lake Louise in Banff National Park. 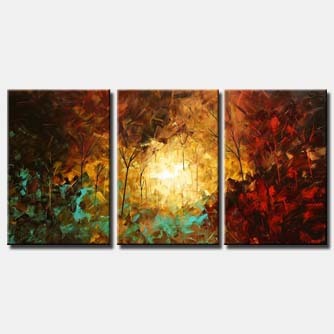 We wouldn’t want it to be an exact replica of the painting per se, but more of an abstract interpretation of the photo. I'm so in love with the painting and want to do it justice could you possibly suggest what color wall that would work with the painting and decor. 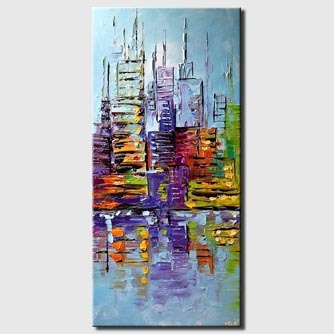 Thank you for getting back to me so promptly, I am very excited that you are willing to use the Perth skyline in the painting. 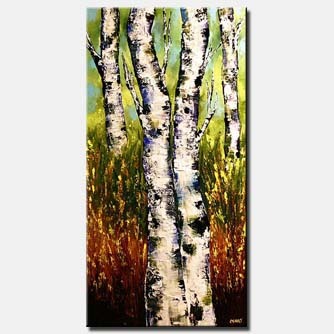 After thinking carefully about it, I would like the painting to be as landscape rather than vertical. The original size of 48” x 24” will be great. I am happy with the prices you quoted. The painting is just wonderful. It is a birthday present for my wife. She said it's probably one of the best gifts I've ever given her, and I've given her some pretty damn good gifts in the past. She Absolutely loves it! I almost feel like a hero at the moment. You have a special talent. I'll be doing business with you in the future. Thanks so much again. Walk With Me is amazing!!!!!!!!! Thank you for all of you hard work. Your pieces have made our house and my wife's yoga studio truly special. well packaged and a speedy delivery. 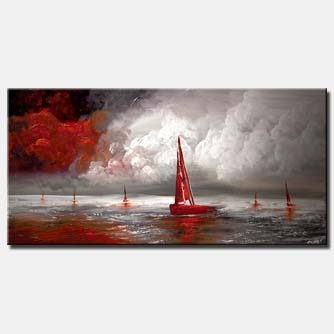 We have it now on our wall looking extremely good, the blues with the white sails looks wonderful. My artwork has arrived and I am so pleased. 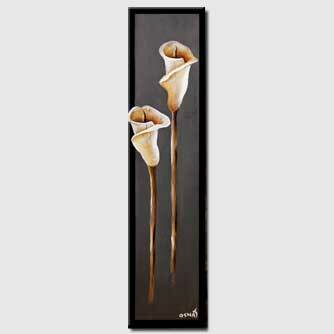 Thank you for the personal care that you have taken and I promise you it will be hung properly, well loved by me and admired by clients daily. Hello, Osnat. I just wanted to close the loop with you and acknowledge receipt of my wonderful painting. I am very pleased with it and have taken it to a local framer to show it off to best advantage. No doubt it will constitute a sophisticated focal point in my new dining room. 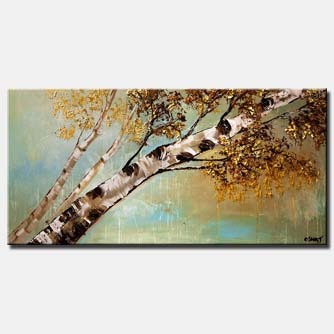 I will watch for other opportunities to bring your beautiful artwork into my home. I received your glicee print yesterday and it is just beautiful! I am very happy with how it enhances my living room. Thank you for your care in making this just right! I would like to thank you so much for getting my art done so quickly! It arrived Friday and we are thrilled with the quality!! Realllly love it! Just what I wanted!!! Nearly cried when I saw! Thank you for the beautiful painting you made for us. We are very happy of our choice, and it adds vibrant colors in our room. All paintings have reached us. My wife and I are delighted in having purchased your beautiful artwork. Many, many thanks for your Artwork. Today we becoms the picture for our living room. I received your painting today. It’s wonderful! Thank you. They are perfect! Thank you!!!!!! I just brought painting home and opened the box. It's beautiful! I received the artwork yesterday. It’s lovely. My painting just arrived 😄. It look just as I hoped for. The painting is beautiful! More than I imagine it. The colors are beautiful. We loved the combination of baby blue and turquoise. Your are truly bless with such talent. Thank again!! The painting arrived already on Friday at our home in Belgium. It was packed very well so it arrived in good condition. It took only one week from the order until the delivery, well done! We are very pleased with it, it upgrades our home. Continue with your beautiful work, we will tell our friends further. My beautiful painting just arrived. It’s absolutely gorgeous in person, the colors are so vibrant. Thank you so much and also thank you for the speedy shipment !! I was so excited. I love it ! I have received your painting today. It’s lovely! Thank you very much indeed. Received our painting today and we absolutely LOVE it!!!! Thank you so much! Just to let you know we received the painting safely. We are thrilled with it it looks great in our room. I am writing to let you know, how much we enjoy your painting Lovely you made for us recently. It is so lively and lovely 🙂. It really brightened up our bedroom. It seems that it has its own life. I just wanted you to know we love the picture. It is even prettier in person. Your a blessed with so much talent. Thank you once again! "Ocean" is incredible! I know that you have given out pieces great time and attention. And “London”, is off the charts!! My daughters thank you as well. We just received the painting. It’s really beautiful and we love it! Thank you for creating such a wonderful piece. We will keep you in mind for any other artwork we may consider in the future. We will also recommend your site to friends and family.